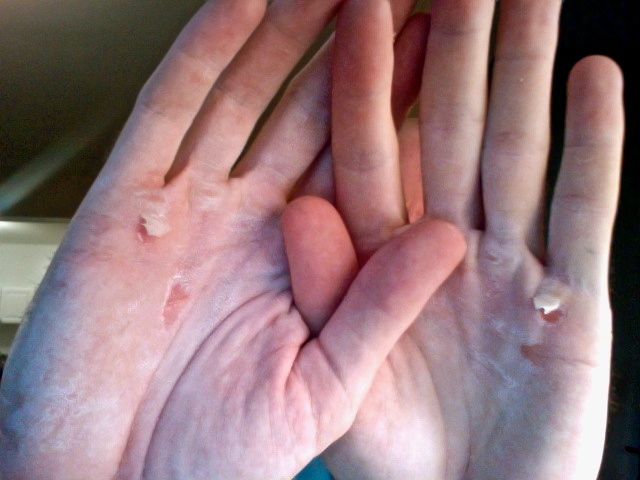 If you do Crossfit for longer than 2 weeks you will end up with torn, ripped hands. 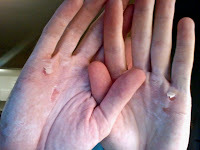 Mine took about 5-6 months before they quit ripping and my calluses were tough enough to make it thru a WOD. They still occasionally get "tender" so I thought I would show you guys how to make hand wraps which will help you make thru a WOD that has a significant number of pull-ups. Step One: You need some good sports tape. I buy mine at Dicks Sporting Goods in packs of 2 for about 5 bucks. You can get multiple colors but white works for me. I don't want to distract anyone from my blue shoes and black knee socks. 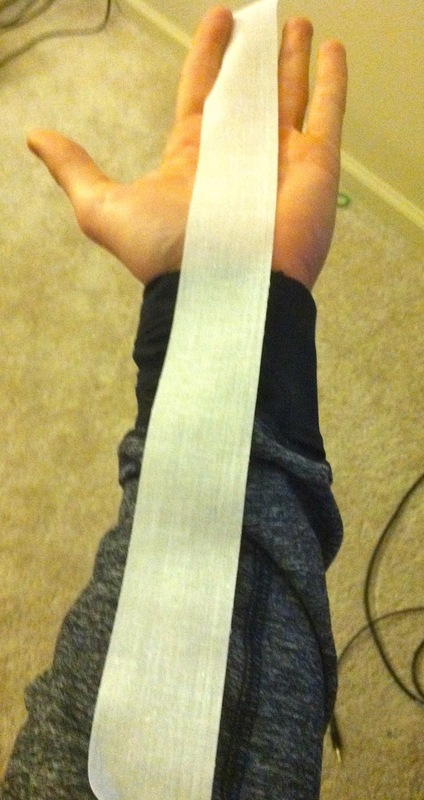 Step Two: Pull the tape to a length from about the tips of your fingers to the bottom of your forearm. I know that seems long but trust me on this. Step Three: Fold the entire piece over onto itself. It will now be half as wide as it was. Step Four: Take one end and touch it to the other creating a "loop" in the middle. 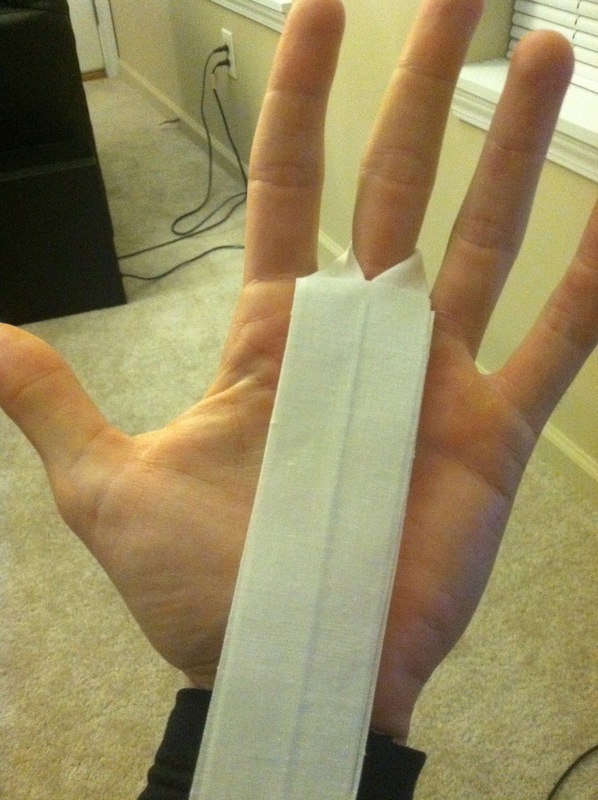 Step Five: Take a piece of tape and fold it over the top and bottom to strengthen the wrap. Step Six: Slide finger thru the loop and wrap separate piece of tape around your wrist to hold in place. That's pretty much it. There are some good vids out on you tube for this as well. Travis taught me how to do it and it takes just a few seconds once you get good at it. I usually make several at a time and store them in a ziploc bag. 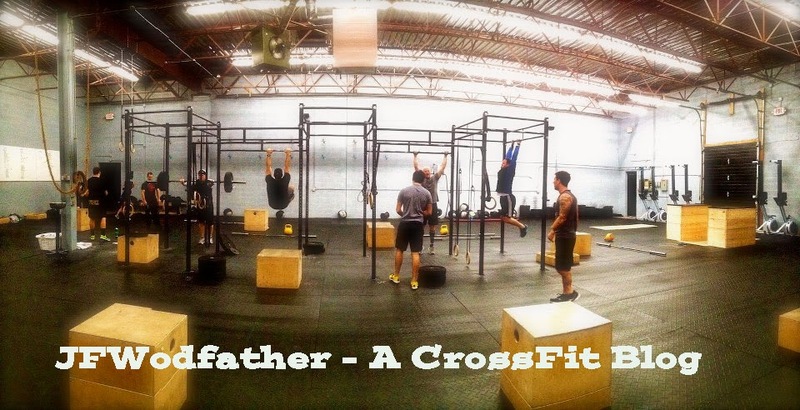 They will hold up for several workouts if you do it right. I also suggest you use a nail file to file your calluses down periodically to prevent ripping and vitamin E oil will help them heal faster. Love it! Torn hands, torn feet - ahh the pain!